On Monday 26 February, a major earthquake occurred in the Southern Highlands of Papua New Guinea, with a magnitude of 7.5 and a surface fault rupture length exceeding 100 km. The earthquake triggered many large landslides over a wide area, and resulted in a call for emergency care for around 270,000 people, and tragically over 150 known fatalities plus an unknown number missing. Many aftershocks ensued, with seven exceeding magnitude 6.0 and causing further fatalities. AuScope’s Subsurface Observatory team was called to participate in Australia’s aftershock monitoring and hazard management response. The earthquakes occurred along the northern boundary of the Australian tectonic plate, which is moving northward at about 70 mm per year producing the Southern Highlands Thrust and Fold Belt. The epicentral region is very remote, east of Tabubil and southwest of Mount Hagen. Further north over the western part of PNG there is a complex series of sub-plates through the Bismarck Sea to the southern boundary of the Pacific Plate, with other similar complications in the east of PNG. The Southern Highlands plays a significant part in accommodating the relative motion between the Australian and Pacific plates. Following the earthquake, AuScope’s Subsurface Observation Project was contacted by the Australian Earthquake Engineering Society. 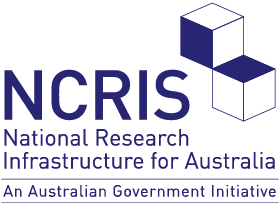 Having already engaged directly with PNG and Australian government agencies, AEES was seeking to assemble a mission to monitor subsequent seismic activity in the region, particularly to record strong motion from larger aftershocks, and to delineate faulting with more precise earthquake locations. The nearest permanent seismograph providing data to the global network was typically at a distance of 500 to 600 kilometres, severely limiting location accuracy, especially earthquake depth estimates. In addition to support from Geoscience Australia, Seismology Research Centre (SRC) and the Seismological Society of Australia, AEES were provided with extensive “in-country” assistance, including helicopter access by Oil Search (PNG) Ltd, and support from the Port Moresby Geophysical Observatory. This support proved crucial to the successful deployment of monitoring instruments throughout the region. Seismologists Gary Gibson (University of Melbourne) and Kevin McCue (Aust. Seismological Centre) planned a temporary seismograph network, with sites north, east, south and west of the aftershock region, plus two within that region. They contacted a number of possible hosts in PNG and selected suitable sites that included a regional hospital, nearby villages and sites within OSL’s oil and gas fields. 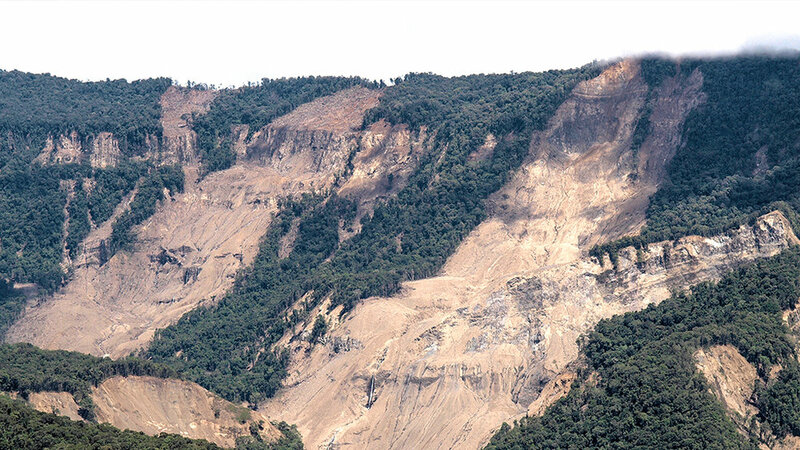 Site selection and access was particularly challenging due to the extensive surface disruptions in a steep terrain frequently emphasised by major landslides. Despite the difficult terrain, the team were able to utilise concurrent aid flights, and even managed to locate one of the instruments to within 20km of the apparent mainshock epicentre. The AuScope Subsurface Observation Project provided six high dynamic range triaxial accelerometers, which are well suited to aftershock monitoring applications. Three high resolution digital recorders were provided by AuScope and three were hired from SRC. To simplify deployment, solar panel power and telemetry of data were not used. Subsequently, the response team has made a return visit to recover data from the recorders. Aftershock activity has diminished significantly, and some recorders will be removed on the next visit. There is a likelihood of a more permanent array with data telemetry being installed, and local operators are being trained in routine operation. For more information please contact Gary Gibson. Endless volcanic eruptions like Jupiter’s Io for early Earth?